CHARLIE THE LION CLOTHES HANGER. WEDDING PARTY BANNERS. Price: £8.95. FLAMINGO WATERING CAN 1.5 LITRES. Quick view. Price: £4.95. JUMBO STORAGE WORLD MAP RECYCLED REUSABLE LAUNDRY BAG. Price: £9.95. 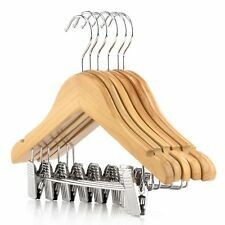 BRUNO THE BEAR CLOTHES HANGER. Price: £8.95. FLAMINGO WATERING CAN 1.5 LITRES. Quick view. Price: £4.95. JUMBO STORAGE WORLD MAP RECYCLED REUSABLE LAUNDRY BAG. Price: £9.95. WEDDING PARTY BANNERS. COOKIE THE CAT CLOTHES HANGER. A great addition to children's bedrooms, this cardboard Cookie the Cat clothes hanger is made from recycled materials. Price: £8.95. FLAMINGO WATERING CAN 1.5 LITRES. Quick view. MIKO THE PANDA CLOTHES HANGER. A quirky addition to the cupboard, kids will love a Miko the Panda cardboard coat hanger. Price: £8.95. FLAMINGO WATERING CAN 1.5 LITRES. Quick view. Price: £4.95. JUMBO STORAGE WORLD MAP RECYCLED REUSABLE LAUNDRY BAG. 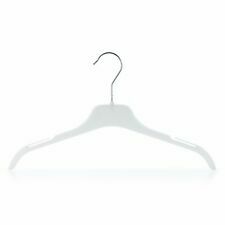 MAGICAL UNICORN CLOTHES HANGER. Bring a touch of magic to cupboards with this wonderful Magical Unicorn children's clothes hanger. Price: £8.95. FLAMINGO WATERING CAN 1.5 LITRES. Quick view. Price: £4.95. 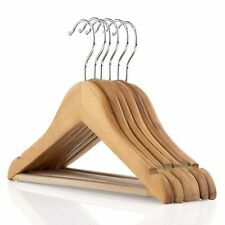 These attractive and luxurious wooden hangers are made with solid beechwood. Available in colours Clear Wood; a light, white washed finish, and Dark Wood; a dark rich mahogony colour - both aesthetically pleasing and versatile. Superb value. 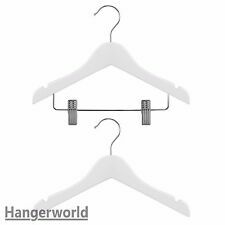 Manufactured by Hangerworld.Trust the Hanger Experts. At Hangerworld we care about the clothes you love. The information will not be used for any direct marketing or unsolicited communication unless you give us permission. 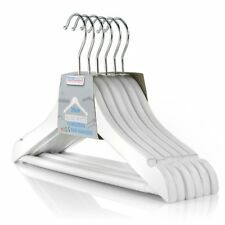 Luxury, padded satin hangers with wire hooks Satin covering holds even the most delicate fabrics without damaging them Include 5 satin hangers Color: White Material: Satin cover, inner wood with padding and wire hook These satin padded hangers are especially designed for smaller garments. Perfect for children's delicate clothing Length: Approx.9 3/4 inch(25 cm) Width: Approx.1 1/4 inch(3 cm) Height: Approx.4 inch(10.5 cm) Package Includes: 5 x Children's hanger Note:Light shooting and different displays may cause the color of the item in the picture a little different from the real thing. The measurement allowed error is /- 1-3cm. Brand Unbranded MPN Does Not Apply UPC Does not apply ISBN Does not apply EAN Does not apply. Pirates make their own rules. I'm a Pirate. What will you be?. Perfect clothes sized newborn to 3 years. Pirate Hangers Set. Hand-painted and hand-carved wooden hangers. 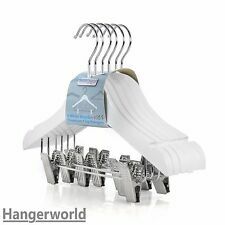 Set of 5 small hangers. Fun pirate design. Superb value. Manufactured for Hangerworld. Trust the Hanger Experts. At Hangerworld we care about the clothes you love. Such information is subsequently disposed of securely. This website and the information and material which it contains are subject to change without notice. Manufactured For Hangerworld. Trust The Hanger Experts ! At Hangerworld we care about the clothes you love. This website and the information and material which it contains are subject to change without notice. Perfect for hanging clothes sized newborn to 3 years, they are hand painted and carved from wood. Perfect clothes sized newborn to 3 years. Dog Hangers Set. Hand-painted and hand-carved wooden hangers. Superb value. Manufactured For Hangerworld. Trust The Experts! At Hangerworld we care about the clothes you love. Such information is subsequently disposed of securely. This website and the information and material which it contains are subject to change without notice. Manufactured For Hangerworld. Trust The Hanger Experts! At Hangerworld we care about the clothes you love. The information will not be used for any direct marketing or unsolicited communication unless you give us permission. Manufactured for Hangerworld. Trust the Hanger Experts. At Hangerworld we care about the clothes you love. The information will not be used for any direct marketing or unsolicited communication unless you give us permission. Superb value. Manufactured For Hangerworld. Trust The Experts. At Hangerworld we care about the clothes you love. Such information is subsequently disposed of securely. This website and the information and material which it contains are subject to change without notice.